Minister Dao Ngoc Dung being taken a photo with representatives of MOLISA press agencies. 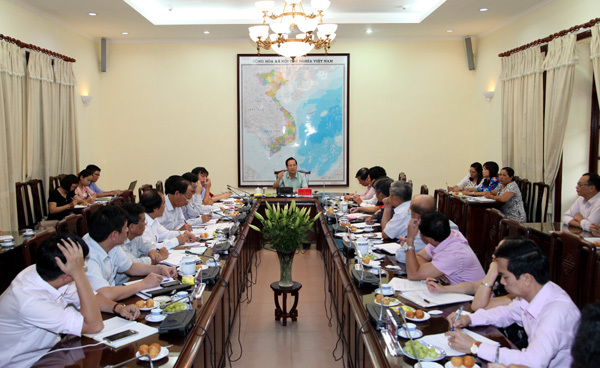 On September 22nd, at the Headquarters of MOLISA, Minister Dao Ngoc Dung had a working session with the press agencies under the management of MOLISA, including: Labours and Social Affairs Newspaper, Labour and Social Affairs Review, Family and Children Review, MOLISA Online portal and Communication Consulting Services. Deputy Minister Dao Hong Lan, leader of MOLISA offices, Department of Organization - Officials and Department of Planning - Finance, Legal Department; Party leaders and key staff of the press agencies related to MOLISA participated in this session. 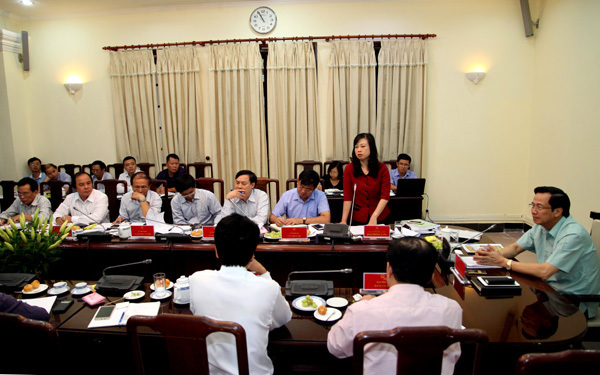 At the meeting, leaders of press agencies reported to Minister Dao Ngoc Dung about their recent performance. According to objectives and target of these agencies and offices on higher level, the meeting would determine which is the priority, breakthrough, the responsibility of the agencies for the press sector for sustainable development. Reporting to the Minister on the development of Labour and Social Affairs Review in recent years, Mr. Bui Van Trach, Editor-in-chef stated: " Labour and Social Affairs Review has always adhered mission and principles, aimed to focus on extensive propaganda and policies of the Party and the State, to clarify the views, orientation, and solutions implemented on labour policy, devotees and society, experience sharing or specific cases during policy implementation at the local. This review is published twice a month with in-depth articles on theory, research and practical issues related to practical goals. The representative of Families and Children Review, Editorial Board of MOLISA online portal and Communications Consulting Services also presented the advantages and difficulties in the implementation of communication tasks, and also mentioned a number of recommendations in order to improve the organizational structure as well as the development orientation in the future ... Next, Deputy Minister Dao Hong Lan and representatives of the Office, Organization Department - Officer, Department of Planning - Finance, Legal Department suggested some opinions focusing on helping press agencies to create a strategic orientation. Deputy Minister Dao Hong Lan appraised the status of MOLISA press agencies in the recent times. Firstly, journalism is a tool and motivation of the MOLISA in the field of ideology. The media needs to reflect, timely grasp of social mood, popular, provide information, guidelines and policies to the people, the introduction of advanced models, cheer generated power to unite to establish trends, build consensus and unity in society. Secondly, information sectors should closely follow the principles and purposes; require expertise, honesty, guarantee the topicality and stick to reality; choose suitable and practical topics to write, contribute to the brand of MOLISA press agencies. Thirdly, the press agencies, the media should strive to be a bridge between the employees and the Ministry. Journalism is on behalf of the Ministry to send of guidelines, policies and regimes of MOLISA to people and worker. It is also a widely forum for employees to participate in the review of policies. Finally, the leaders of press agencies should develop a contingent of journalists about the political qualities, professional skills, creativity, encourage, create a playground for talented journalists, the main writers; care of livings for officials, reporters, editors; vocational training and employment linked to the labour market; join TPP and sustainable poverty reduction ..